“This place leaves no one untouched. When you enter this cathedral, it inhabits you,” said Anne Hidalgo, the Mayor of Paris, in front of the burning monument. In the light of the day, the extent of the destruction was stunning. The cathedral’s 93-metre spire had collapsed, two-thirds of the roof was destroyed and parts of the interior were grievously damaged. 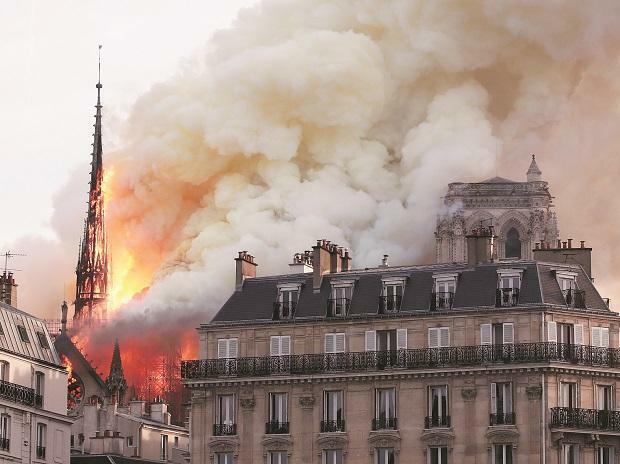 But thanks to the efforts of 500 firefighters, the structure of the cathedral itself was “saved and preserved in its entirety”, according to Jean-Claude Gallet, commander of the Paris Fire Brigade. Two towers with their immense bells still stand and many of the cathedral’s priceless treasures survived. Of all the historic monuments on earth, Notre-Dame de Paris is one of the “superstars”: its unique history, exceptional architecture and renowned artefacts attract millions of visitors to Paris. Indeed, the cathedral can be described as an intangible strategic resource with few global equivalents. Notre-Dame de Paris is first and foremost an exceptional place of Christian and Catholic worship, dating back nearly 1,000 years. It’s a jewel of Gothic art with countless treasures, including radiant stained-glass windows, the crown of thorns and tunic of Saint Louis, and the choir organ. It is collectively classified as a Unesco World Heritage Site. As a direct consequence of Notre Dame’s history, architecture and art, of its place in culture and literature, the cathedral is the leading monument in Europe, with approximately 14 million visitors in 2018. It is one of France’s “primary assets”, the “cathedral of cathedrals”, a must – the actual word is used in French. World Heritage Sites arouse emotions and emotions reveal shared values. Such emotions were on the faces of all those gathered in front of Notre Dame, the countless messages from heads of state, the flood of heartfelt sentiments on social networks – Notre Dame’s place in the collective imagination and worldwide influence is undeniable. “Notre-Dame de Paris is our place, it is our history, our literature, our imagination, the place where we have lived all our great moments […]. Such monuments encourage us to identify with them emotionally. They’re keystones to national identity, and can even further international relations. The agonised reaction to the fire at the cathedral mixes sentimentalism, nostalgia and nationalism in a way that is deeply linked to the past, as related by historian David Lowenthal in his study The Past is a Foreign Country. Into the evening of April 15 and through the next day, an exceptional effort began to take form: The French president launched a national donation effort, Unesco pledged its support and mayors of towns large and small throughout France stood up as one. The wealthy Arnault and Pinault families have promised to donate a total of 300 million euros to the future restoration, and thousands of individuals have pledged their support. Before the path to cathedral’s rebirth can be mapped out, we need a serious assessment of how the tragic destruction of such a priceless monument was even possible. It was undergoing renovation at the time of the fire broke out, and this raises questions about the requirements for work on historic monuments, and also the level of resources allocated. Art historians such as Alexandre Gady and Didier Rykner have stated that the fire could and should have been avoided. They state that even if Notre Dame is “repaired”, we have already in a sense “lost it”. It is near certain that the cathedral cannot be rebuilt exactly as it was before. The fire started deep within the roof, which was under repair at the time. The oak frame dates from the 13th century, and according to experts, reproducing it would require a forest of 1,300 oak trees. One alternative is to use innovative techniques, as architect Henri Deneux did when he rebuilt the cathedral of Reims after it was nearly destroyed during the First World War. The cathedral of Reims in 1914. Wikipedia, anonymous. Monuments in general and religious monuments in particular are fragile. Against all odds, Notre Dame survived periods of immense turbulence in French history, and was touched by neither bombardments nor significant fires, a constant threat prior to the 1752 invention of the lightning rod. Until April 15, it had come to us remarkably preserved, and millions of visitors paid tribute every year. Yet the risk of the unimaginable still remained. “It’s in our nature to mourn when we see history lost – but it’s also in our nature to rebuild for tomorrow, as strong as we can,” former US president Barack Obama said the night of the fire. Notre-Dame de Paris is the heart of the city and of France, and an inspiration for the world. We are all cathedral builders, in a moment of sacred union in a secular society. Translation from the original French by Leighton Kille.